So recently, there was a debate between two Calvinists and two Arminians about the subject of predestination and God’s role in salvation. The Calvinist debaters were Daniel Montgomery, pastor a Sojourn Church in KY, and Timothy Paul Jones, a professor at Southern Seminary. They recently published a book together called PROOF, which was a rehashing of the TULIP acronym. I read the book, and would encourage anyone to read it. The Arminian debaters were Austin Fischer, recent author of Young, Restless, No Longer Reformed. His partner was an odd fellow I had never heard of named Brian Zahnd. I have followed Fischer for quite some time, and have been fascinated by his very quick transition from Calvinism into a liberal type of Arminianism, following the likes of Roger Olson et al. I want to start by commenting on the strengths of each side, then the weaknesses. First, the Calvinist side clearly used much more biblical texts to back up their claims than their opponents. I mean, it was ridiculous how much scripture Daniel Montgomery brought into his arguments. Timothy Paul Jones did entire expositions of texts. This encouraged me, being a Calvinist myself. It was encouraging to see each of them not only mentioning texts, but also explaining and interpreting them for us. However, the Arminian side had some strengths too; though they had less scripture, the Arminians had better rhetoric and responses. What I mean is that both Fischer and Zahnd were able to respond to and critique the Calvinist side in a very persuasive manner (of course, persuasion doesn’t make you right — but it helps!). Contrastly, the Calvinist side didn’t really respond much. Instead, they mainly posited their positions. And for a debate, you have to be able to critique, pick apart, and see the arguments behind the arguments. As I said above, I thought the Calvinist side should have responded and critiqued the Arminian side much more than they did. There were several times when Fischer would contradict himself, or say something wrong, which the Calvinists never picked up on. For instance, Fischer asserted that none of the early church fathers were Calvinistic. This is a sore overstatement. The theological nuance of the early church fathers is still debated today. However, neither Montgomery nor Jones critiqued Fischer for that. Also, Fischer asserted that the only way Calvinists can believe that God is both good and completely sovereign is to ascribe mystery to the doctrines instead of explaining how they work. However, when Fischer described his doctrine of synergism, he repeatedly said it was a mystery, and never completely explained it! This, to me, was a sore misstep for Fischer. But, the Calvinist side never picked up on that either. I think Montgomery and Jones should have been much more critical of both Zahnd and Fischer. The biggest weakness I saw on the Arminian side was the lack of scripture used in their arguments. What I mean is that they never really explained any biblical texts in depth. They may have spouted out a few texts here and there, but they never really considered the meaning or the context. For instance, Fischer started the first video by denying pretty harshly that God decreed or predestined anything. But for all the time he argued against predestination, he rarely brought in scripture. Also, when Zahnd began critiquing the idea of predestination, he insisted that the doctrine was inconsistent with “the revelation of God in Jesus Christ”. To him, Jesus’ teaching, life and death, (all those red letters … getting it?) was a more sure word then the Bible (in fact, he pitted the Bible against Jesus, which Jesus himself never did). Soon into the debate, it became obvious that Zahnd either questioned or denied the infallibility of the scriptures. Of course, I do want to recognize, Fischer did quote some texts here and there, especially during his synergism explanation. But he never really got deep into the texts. It’s easy enough to spout out a few verses that sound like they support your position. It’s altogether different to do an exposition of those verses, which the Calvinist side did a few times. The bottom line: who won? Here’s the issue with a debate like this. At the end of the day, the Calvinists (with whom I agree) held to the biblical inerrancy of scripture. And because of this, they argued not only from the red letters, but also in the rest of the Bible. And so they brought in a myriad of texts which supported the idea that predestination was in fact true. They brought in texts from the Old Testament, New Testament, epistles, and so on. They brought the whole gambit. And for that, they had a doctrine that really was supported by all of scripture. In the end, the Bible was their primary source. However, from the Arminian side, it became more and more apparent that the Bible was a secondary source for them. For them, the true and trustworthy source was “the revelation of God in Jesus Christ”. Over and over, you would hear, “The God of Calvinism is incongruent with God as revealed in Jesus Christ”. However, and here’s my rub with the Arminians, they never really dug into the texts to support this idea. They never in-depth scriptural support, especially from the Old Testament, that the God as revealed in Jesus Christ was Arminian. Instead, they imported their own understanding of Christ into the Bible. They never considered texts like John 6, 8, 10, 17, and others, in which Jesus himself teaches predestination. They never considered the fact that Jesus came to do the will of his Father in heaven (Jn 6:38), which presupposes that Jesus came to accomplish a predestined redemption. The Arminians never brought these texts up. They couldn’t. Instead, they continued to repeat, “the God as revealed in Jesus Christ is incongruent with Calvinism”. To me, that really weakened their arguments. And it’s because their understanding of Jesus came first, and the Bible second. “The Old Testament is the inspired telling of the story of Israel coming to know their God. Along the way assumptions were made and they didn’t get everything right. Keep reading the Bible until you come to Jesus and then center your reading of all Scripture in the light of Christ”. Do you see what he’s saying? It’s subtle, but here’s what he’s saying: If the Old Testament disagrees with your understanding of Jesus, reject it; it’s not reliable. Because after all, Israel made some bad “assumptions” along the way that we now know are wrong. Zahnd rejects the infallibility of the scriptures, and that affects his theology, including his theology of Christ and salvation. He imports an understanding of Jesus into the scriptures, picks and chooses what he likes from the Bible, and forms a theology from that. This is not healthy exegesis. Just in case you don’t believe me, here’s another post by Zahnd where he allows his understanding of Christ to lead to an utter denial of substitutionary atonement. It’s pretty obvious to me that the Calvinist side won, no problem. If you don’t use the Bible to form your doctrine, your doctrine will always inform the way you read your Bible. 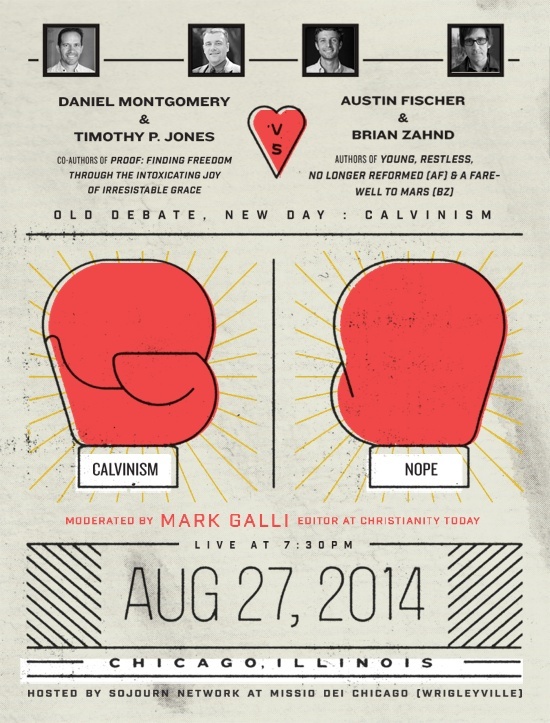 What’s at stake in this entire debate is the Bible, not simply Calvinism or Arminianism. And I’ll side with the Bible all day long. This entry was posted in Bible, Culture, Ministry, Problem of Evil, Theology, Total Depravity and tagged Austin Fischer, Brian Zahnd, Calvinism vs Arminianism, Daniel Montgomery, debate 2014, Old Debate New Day debate, PROOF, Young Restless no longer Reformed. Bookmark the permalink. Absolutely! It’s all about what the Bible says, not what feels good to our sinful human minds. Great post! Thanks for sharing your thoughts!